"I was once the type of person who was impressed by starlight; the type of person who would dance beneath glass ceilings and let the world swim in its loveliness. The sky reminds me of the parties we used to throw - parties like the one last night. The memories bring back the trill of harps and endless ripples of satisfied laughter. Now, though, when I try to recall what I felt, all I hear is screaming." 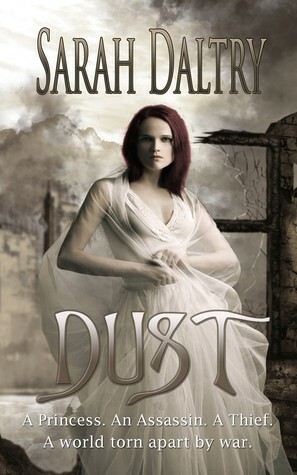 I received a copy of Dust for review from Little Bird Publishing. Thank you!! I wasn't able to fully understand the magic system in the world of Dust- is it something anyone could learn, or hereditary? Who issued the prophecy about Alondra, Seamus, and Tevlin? What exactly happened in the much-referenced Wars? The backstory for the book definitely needed more fleshing out. I would have been able to comprehend and connect to the current story if I got the references and the histories of the world and the characters. A prequel to Dust would be an awesome solution to this. All the characters were nice and complex. I liked how Alondra was rebellious and wanted to choose her own fate but ultimately loved her people more than herself. It was also refreshing and realistic to see her somewhat lose herself during all the destruction- hating everything and not caring if it burned. It was the kind of madness that SHOULD happen to a sheltered girl who witnessed so much carnage and death to and by the people she loved. This happens a lot in YA literature- only in one book that I can think of (Mockingjay) did we receive a description of what a traumatized person would really be like, so that's lots of brownie points for Sarah Daltry. Another thing I enjoyed, contrary to public opinion on Goodreads, were alternating then/now chapters. Admittedly, it took me a little while to buy into it. When I did, I thought it was great! It really showcased the character development Alondra goes through and the stark contrast between the world at peace and the world at war.